Hello September! It now feels officially appropriate to eat pumpkin and apple flavored things. 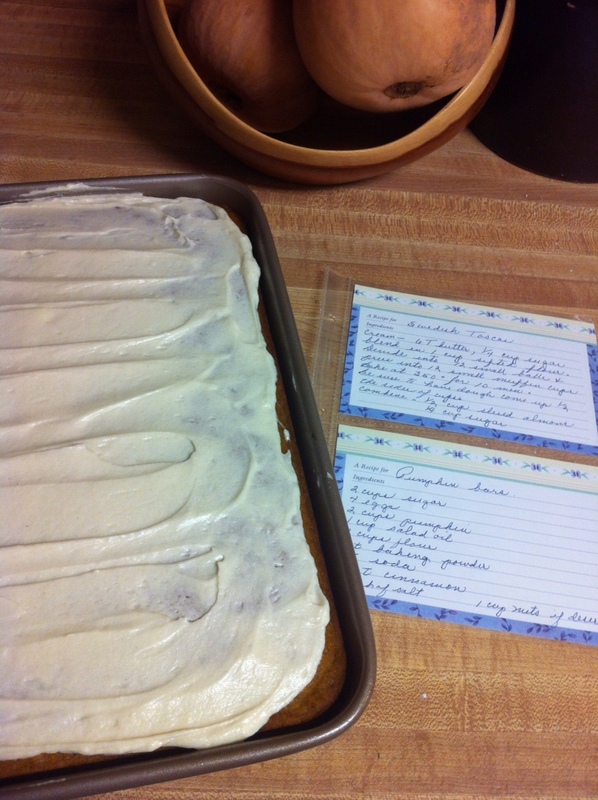 To kick things off I made another Grandma specialty, Pumpkin Bars. These bars are a delicious way to bring in the fall. They’re a big crowd pleaser, so you’ll be glad to have a whole sheet pan! If you really like cream cheese frosting you’ll want to double the frosting recipe, this makes just a thin layer over the sheet cake. Preheat oven to 325°F. Grease a large sheet pan with cooking spray. In a large bowl, combine pumpkin, eggs, sugar, and oil; mix well. Sift together the dry ingredients and mix into the wet ingredients. Spread batter evenly in sheet pan. Bake for about 25 minutes, until a toothpick inserted into the middle comes out clean. Allow to cool completely and then frost. Beat cream cheese and butter until smooth and well blended. Add vanilla, cinnamon and half of the sugar, blend well. taste and add more sugar as desired. Spread over cooled cake.